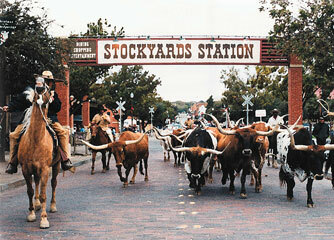 Stockyards Station is a unique western destination located in the National Historic Fort Worth Stockyards district. It was once the biggest and busiest livestock-marketing center in the Southwest. Stockyards Station is now home to over 20 unique shops and fantastic restaurants; including galleries, clothing stores, jewelers, antiques, specialty stores and much more. This fabulous shopping center is also the depot for “Puffy” the steam engine built in 1896 - the only operational steam locomotive in Texas from the 19th century. The Station offers historical walking tours, the Cowtown Cattlepen Maze, horseback riding along the Trinity River Trails, banquet facilities, and regularly scheduled special events and festivals. Choose from one of our famous restaurants as the best location to view the Fort Worth Herd, a daily longhorn cattle drive in which authentic cowboys drive the herd down East Exchange Avenue. Banquets, Parties and Meetings are happening all the time at Stockyards Station. There are 4 banquet facilities in Stockyards Station, indoor and outdoors, totaling over 30,000 square feet of meeting space. AmeriSuites Historic Stockyards hotel is now open in Stockyards Station. The hotel has 101 suites, and includes an outdoor swimming pool, a business meeting room, and will utilize Stockyards Station’s banquet facilities for conventions, meetings and more. Experience authentic Texas and the proud western heritage of Cowtown, and enjoy shopping, dining, and big fun, Texas Style here at Stockyards Station!